Dear Readers: In case you haven't noticed, I do not have advertising on my blog or website. I do however, like to bring to the attention of the mahjongg community products or experiences that they may find interesting or helpful. Karen contacted me about the mahjongg China trip and I thought it sounded awesome. I've invited her to write a guest post about it. Just reading about it takes you into another (mahjongg) world. How great would it be to take the trip? I will be back shortly with another one of my fascinating blog posts. In the meantime, enjoy your travels! (Wasn’t Dean Martin one good-looking son-of-a-gun? Here is the guest blog I wrote. I hope it will be an interesting read for your followers. Just a very . . . short note about myself: When I'm not playing Mahjong or traveling, I am working on my family's coffee farm on the Big Island of Hawaii. There is something about the "clattering of sparrows" that has a special power to bring people together. I learned to play Mahjong from my mother. And then I taught my daughter and husband how to play. From the moment the tiles land on the table, we are engaged in not only a game but a time for us to share stories and enjoy each other's company. I find Mahjong both simple and complex at the same time. You can learn the basics in minutes but it takes years to master the game. I enjoy learning all the different styles of play. Each one has its own magic. Classical Chinese seduces you to the table with its simplicity, only to learn that there is more strategy than just saving Chows, Pungs and Kongs. Hong Kong style adds a twist that requires players to save a more challenging collection of tiles than just whatever fits together. When you play American style, you either win or lose. No need to tally scores or points; you play for the Mahjong! Mahjong, like the country of China itself, is rich in colorful tales and legends. A romantic myth ties its origin to the great Chinese philosopher Confucius in 500 B.C.E. and the three dragon tiles to his three cardinal virtues of benevolence, sincerity, and piety. It is said that Confucius loved birds, and thus the game's name: the Chinese word for "sparrow." 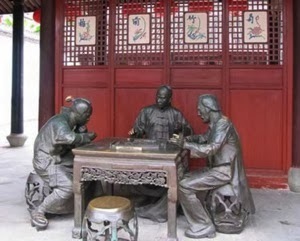 In my pre-farmer life, I was an historian, so I wanted to learn more about Mahjong's real history and how it connected to the cultural life in China. I looked for tours that combined both the historical beauty of China and a love for the game. I wanted something truly special that would allow me to be a traveler and not a tourist. I wanted to see places that many visitors never get to see. I couldn't find such a tour and so I decided to create my own. Two years ago, I began working with a highly respected tour company, Marco Polo & Co., and together, we created an amazing, one-of-a-kind adventure. We will be traveling with experienced guides who share our love of Mahjong on this all inclusive, 5-Star experience. Every detail has been considered leaving us the freedom to enjoy each destination. With each part of the country we visit, we will explore new styles of play. We will learn how Mahjong has evolved over the years and how the game differs from region to region. Our own Classic Chinese Mahjong tournament will provide us the opportunity to learn how to play and to develop our strategy and win prizes. We will visit one of China's oldest cities, Ningbo, to explore the ancestral hall and birthplace of Mahjong. Here we will learn the origins of the modern version, shifting from cards to using bamboo tiles. In Beijing, we will experience the rumble of the tables as locals test their skill and luck in a real Mahjong parlor. 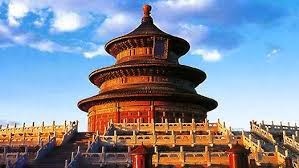 While there we will visit the Forbidden Palace and the Temple of Heaven. We will stand on the exact same stone on which emperors have stood for millennia. Shanghai will find us shopping along the Dong Tai Lu for treasures - maybe finding a wonderful antique Mahjong set to bring home. We'll stroll along the Bund and enjoy the view of the city's famous architecture. Evenings will be filled with sumptuous dinners and entertainment. Imagine playing in upscale Mahjong parlors for exclusively designed prizes. Unrushed, unrestored, and uncrowded, we will enjoy our lunch on the Jinshanling portion of the Great Wall. 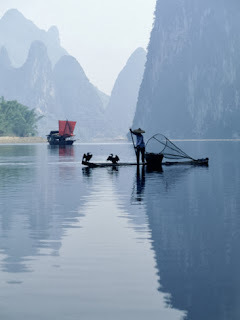 We will explore daily life as we travel along the Li River on our own private boat. Limestone hills, water buffalo, rice terraces, and fishermen make up the beautiful scenery. Terra Cotta Warriors, the Panda Breeding Center, and the Giant Leshan Buddha are all a part of this journey. We'll see how Mahjong tiles are handcrafted and test our own skills in Macau, the "Monte Carlo of the Orient," where Mahjong is played in the casinos alongside Baccarat and Blackjack. It is going to be a dream come true.